When Aldebaran rises not too long after sunset, you know winter is on the way. It’s now well visible in the east by 8:30 pm. Capella lies to the north. 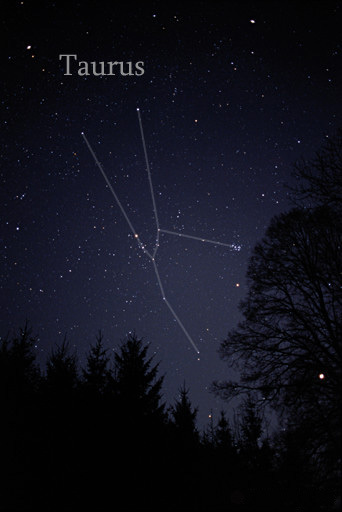 Aldebaran is the eye of Taurus the Bull, a prominent winter constellation. The rest of the Bull’s face is a ‘v’ shape with Aldebaran at one tip and running to the south and back up again to another much dimmer star called Ain. Aldebaran forms the Bull’s fiery eye. In dark skies, or when the moon is close by, Aldebaran takes on a reddish-orange tint. This is another red giant star, like Betelgeuse, only not quite as big, but like Betelgeuse, nearing the end of its shining life. Stars are in a constant tug of war between gravity, which pulls the star inwards, and energy generated in the star’s core, which pushes back outwards. The fuel powering Aldebaran is running low. When it drains completely, the star will no longer be able push back out and gravity will win. The star’s core will collapse into an extremely dense object, essentially a ball of neutrons called a neutron star. One teaspoon of neutron star material would weight several million tons at Earth’s surface. This extremely dense core forms a solid wall into which the rest of the star’s layers will slam as they rush inwards during the implosion. This inflow of gas will ricochet off this dense core creating a massive explosion and dazzling amounts of light energy – a supernova. The neat thing about supernovas, apart from the fact that they are among the most energetic events that can happen in our universe, is that they are responsible for more than half of the elements on our periodic table. Our universe started with hydrogen and a tiny bit of helium. Then nuclear reactions in stars changed things. Nuclear reactions are what gives stars the energy to fight the tug of gravity. Stars are most often turning hydrogen into helium by slamming hydrogen nuclei together. When the star runs low on hydrogen, it slams helium together to form oxygen, carbon and a few other heavier elements. Once most stars try this, they actually make too much energy and not only balance the inward tug of gravity, but actually blow the star’s outer layers, with the newly-minted helium and heavier elements, gently into space. In the largest stars, however, things work a bit longer, until the star begins to try and fuse iron atoms together. To do this, the reaction actually requires energy to work – and robs it from its surroundings, causing the star to quickly use up the energy in its core causing it to collapse into a neutron star. But the neat thing happens as the outer gases ricochet off the core of the star. These atoms pick up neutrons from the core, in an extra fast nuclear reaction. See how well they match the computer simulated predictions!